I first found this group because Mary from One Perfect Bite and gave me my first not-family-or-friends feedback on my little space on the internet. I started following her and was intrigued by the 50 Women Game Changers in Food series, not only to explore the recipes of these incredible women but to also join in on the camaraderie of a lady blog group. I have learned so much from the list of ladies as well as new recipes from this group, and for that I am grateful. 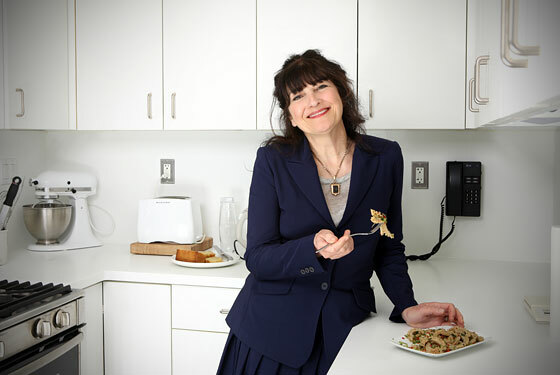 Today, I wanted to highlight one of the women who brought this list to us, Ruth Reichl. Ruth began her career in 1972 as a food writer with her book Mmmmm: A Feastiery. As co-owner of The Swallow from 1973-1977, she played a major part in the Berkeley culinary revolution. She continued her career as a food editor and restaurant critic until she took the helm of Gourmet Magazine in 1999. Gourmet unfortunately stopped their presses in 2009, but still runs a weekly Gourmet Live app where every Wednesday a mini-issue is released. In one of these mini-issues, the list of food game changers was released. Because of Ruth's association with the magazine, she was unfortunately not featured in the 50 Women Game Changers. But trust, she is definitely a game changer! Any women who can claim to be apart of a "food revolution" should deserve a spot on a list of game changers, women or not. Her mission to demystify the world of fine cuisine helped both in her success in food writing and editing as well as gaining readership from little girls like me who read Gourmet from cover to cover every month thinking "I can make this too!" Even if I didn't realize it until this series, this woman has definitely shaped my life. And for that, I'm also grateful. To honor Ruth, I chose a dish she featured for a WNYC interview in 2009 called Recession Recipes with Ruth Reichl. Listening to the podcast, you can hear the passion in her voice to remind people that food should be honored by cooking thoughtfully. As a graduate student, I don't have the luxury of not being thoughtful of what I cook, at least in terms of price and use. I wouldn't call myself a vegetarian (read: bacon fan) but I do often cook that way to avoid meat costs. I chose the Flat Zucchini Omelette because despite its simple appearance, there are little tricks in there that are unexpected and ingenious. Zucchini is shredded and browned before combining with marjoram, a beautiful combination perfected by the French (which I will be using a lot more now). Then the omelette is cooked in nutty browned butter to add another punch. It is these simple touches that make a dish remarkable and memorable, even without the meat. In closing, I want to thank Mary and the entire group, all of the women game changers, and Ruth Reichl. Because I came in to the series very late in the game, I will try to fill in the gaps and continue my education of these amazing ladies. In addition, a few of us will next be tackling a series on using great healthful ingredients based on the book Power Food: 150 Delicious Recipes with the 38 Healthiest Ingredients from the editors of Whole Living Magazine, starting with Artichoke. I'm looking forward to what's coming next and I hope you are, too. Also, here is a great place to see everything we accomplished along the way! Begin by grating the zucchini. You can use your grater or the grating attachment of your food processor. Put the zucchini in a collander and draw out the water with 1 teaspoon of salt. Let sit for 30 minutes and squeeze out as much liquid as possible. Saute over medium heat with the 2 tablespoons of olive oil and cook until golden, about 6-7 minutes. Remove from the heat and add the remaining salt, pinch of marjoram, and black pepper. Let cool before whisking into the eggs. Once you are able to mix the eggs with the zucchini, begin to brown the butter over medium-high heat in a non-stick saute pan that has a corresponding lid. The recipe suggests an 8 inch, I had a 10 inch and it worked perfectly. When you can smell the nuttiness of the browned butter, add the egg mixture. Use a spatula to ensure even distribution of the zucchini as well as moving uncooked egg to the edges of the omelette to allow access to the heat. The bottom will set after about one minute. Lid and lower the heat to medium low, cooking for about 3 minutes to help set the middle of the omelette. Slide the omelette onto a plate. Use said plate to help flip the omelette and brown up the second side. After cooking for 1 more minute, slide out onto another plate so that the browned butter side is face up. I topped with a few crumbles of goat cheese I mixed with a very small pinch of marjoram and a few cracks of pepper. Delicious and easy, enjoy! Mmmm...that omelet is gorgeous! Ruth would have been my addition to the list, as well. So nice meeting you through this venture =). Interesting post and too true costs are not to be overlooked in our lifestyle. Good to meet you and Ruth.